Needlework is a labour-intensive and extremely skillful craft. It takes a meticulously patient and careful artist to work with this medium, but those who do find it extremely rewarding. 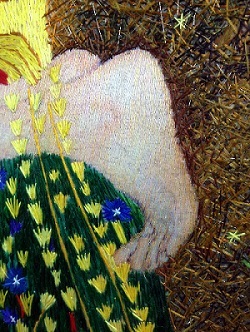 Because needlework is often very delicate framing this type of art can be difficult. Typically the fabric will be stretched over a board so that the image or the stitching will be taught. This helps to eliminate wrinkles and sagging. The stretching needs to be done very carefully however, so that final piece is not skewed in any way. Framagraphic Custom Picture Framing offers a variety of framing options for needlework. Whether stitched on mesh, or on cloth, from fine petit-point to cross-stitch, our framers are able to tackle even the most complicated pieces. 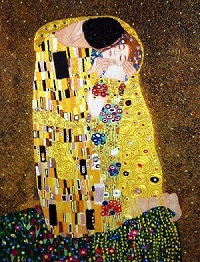 One of our most recent customers brought in an embroidered piece of Gustav Klimt’s The Kiss. It is very interesting to see how one image can be transformed entirely by the medium that is used. From paint to thread, this version of The Kiss is an entirely different viewing experience.